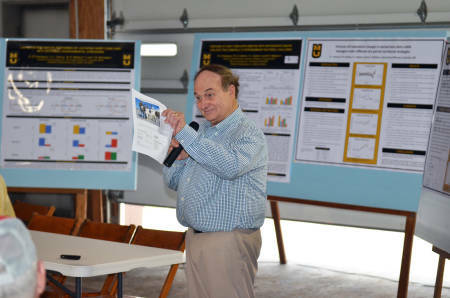 Posters containing information on the recent research from Division of Animal Sciences and the College of Veterinary Medicine were displayed in various buildings at the Foremost Dairy Research Center. Images courtesy of CAFNR News. Dylan Hamlin, a graduate student studying ruminant nutrition, discusses the findings of a study with Chris Lenz, a dairy farmer from Prairie Home, Mo., center, and his son, Chris. State Rep. Bill Reiboldt addresses the crowd before a tour at the Foremost Dairy Research Center. The timing just seemed right. 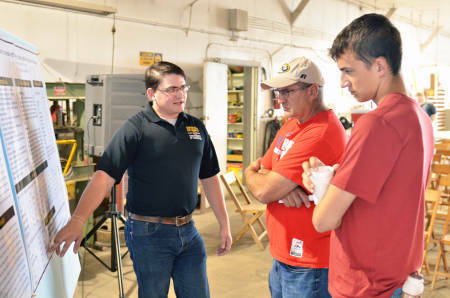 That was the consensus of those who helped organize the first tour of the University of Missouri’s Foremost Dairy Research Center by members of the Missouri Dairy Association and the Missouri Dairy Growth Council – and several other dairy farmers across the state June 19. Those stars included June being recognized as National Dairy Month and the recent approval of the Missouri Dairy Revitalization Act earlier this year, which was sponsored in the Missouri House of Representatives by Bill Reiboldt from District 160, Neosho, and later signed by Gov. Jay Nixon. The landmark legislation, the first to be passed by any state, provides additional support to the dairy title provisions of the federal Farm Bill. The Act includes the addition of 80 scholarships at $5,000 each toward tuition at any college or university in the state for students who major in agriculture-tied degree programs, as well as the continuation of a loan program for large-animal veterinary students. 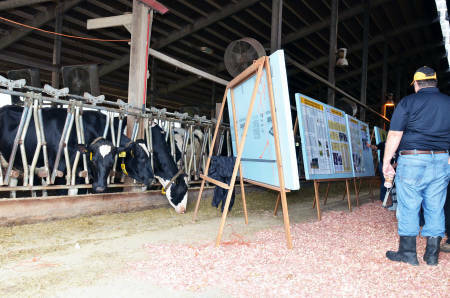 In the spirit of the act’s approval, the College of Agriculture, Food and Natural Resources’ Division of Animal Sciences joined forces with MU’s College of Veterinary Medicine to show how both schools can provide invaluable resources to the state dairy industry. The MU Extension Dairy Team includes faculty from both colleges and MU Extension. In addition to student-guided tours of the facility, students from each of the programs displayed posters of recent findings and discussed their research with attendees.